The Reloop Tape 2 is the successor to Reloop’s first portable digital recorder designed with the DJ in mind. It provides a quick and portable way for DJs to externally record their DJ set with just a push of a button. Reloop did a great job of improving upon the original Tape in many ways, making Tape 2 a more enticing purchase. Tape 2 provides DJs with an easy to use digital audio recorder that could easily slip in your pocket or DJ bag. 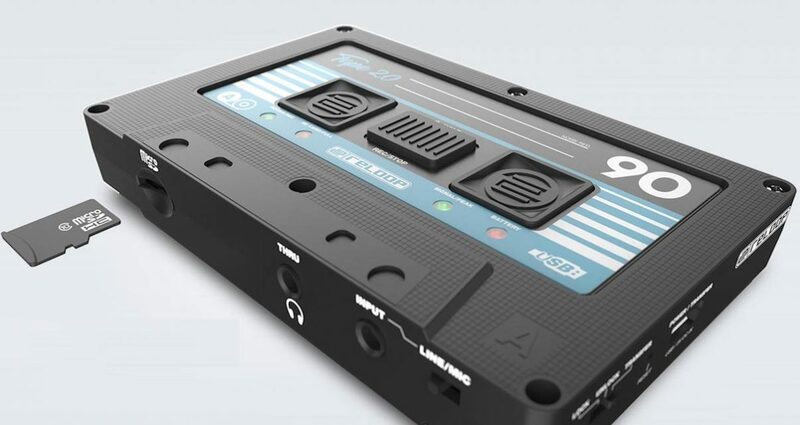 At first glance the Reloop Tape 2 can easily be mistaken for an actual old school cassette tape, but sorry DJs this “tape” won’t work in your old tape deck. Upon deeper inspection the differences become clearer: Tape 2 makes use of almost all its sides to provide different controls and functions while still making it quite easy to use for recording your DJ sets. Reloop made some key changes from the first Tape that make Tape 2 significantly better. The most notable would be the ability to now record in WAV format, previously users were only able to record in MP3 format. Reloop removed the need for a bulkier USB flash drive to save mixes and replaced it with a much more portable micro SD card option. A control for the input gain was also added which allows users to control the recording input level directly on the Tape 2 instead of having to adjust controls on the DJ mixer. Finally Reloop removed the need for external AC power in favour of a built-in rechargeable battery which Reloop says should last approximately six hours. Starting with the face of the unit, we have a single button that handles the unit’s on/off switch and starting / stopping a recording. Under that are four LED lights that provide visual feedback for important functions. Things such as power / recording, micro SD card status, receiving signal / peaking, and battery status are all easy to see because of these LEDs. The bottom of the unit is where you will find all of the input/output on Tape 2. This is where the mic/line input select switch, the 1/8″ input and thru output, and the micro SD card (which can be up to 128GB) slot is located. Tape 2 comes with an 1/8″ to RCA cable that allows for easy connection from most DJ mixers to the Tape 2. On the other side are controls for transferring your files and where you can charge the built-in rechargeable battery. There is a three-position function switch here: the first position protects the micro SD card from being overwritten. The second allows the micro SD card to be recorded to, and the third position turns the Tape 2 into a micro SD card reader which makes transferring files to a computer simple. Reloop has made the process of pulling the Tape 2 out of your bag to starting a recording pretty seamless. Just power on the unit, plug the included 1/8″ to RCA cable into the Tape 2 and into the Rec or similar output of the DJ mixer or controller (and if your hardware doesn’t have an RCA output you can use adapters to make it work for your setup), then hit the record button to begin recording. Then when you’re done hit the record one more time to end the recording and save it to the micro SD card. A big question many DJs will ask is: “Why would I use this if my DJ software has a record function?”. DJs who spin with USB thumb drives and a CDJ/DJM set-up do not have a recording option like DJs that use laptops with software. 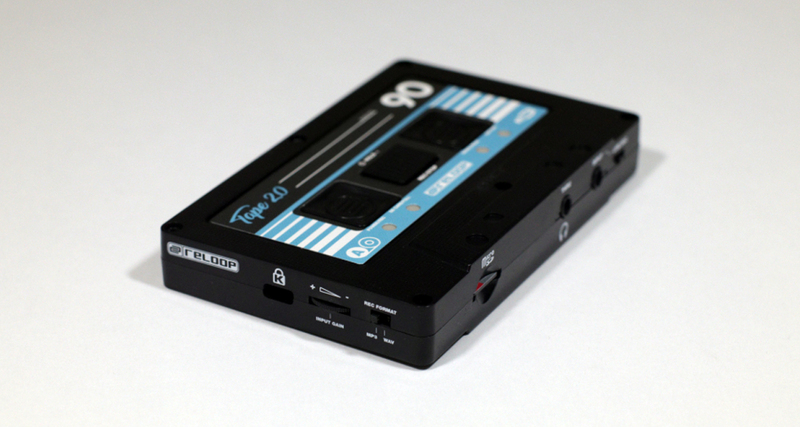 The Tape 2 provides a very simple way to add that functionality to an existing DJ setup. Reloop combined the novelty of the cassette tape with a small portable digital audio recorder when it introduced the first Tape. With the Tape 2, Reloop has refined the design making it even more portable and easier to use than before by adding input gain control and removing the need for a USB flash drive and AC power. If you are looking for a simple way to record a DJ set that is portable as well, the Reloop Tape 2 is a good option. Really like this Item…and will buy it….but on the Reloop site 90% of the places to buy this Item are not available. They don’t even carry it yet. Needs to be updated. Almost $200. I pass for sure..